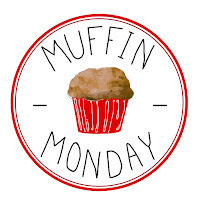 Today is Muffin Monday and I have a fabulous recipe to share with you. Muffin Monday is a wonderful group of bloggers led by Stacy of Food Lust People Love. Stacy is the Queen of Muffin Madness and we appreciate all her hard work and love all her wonderful recipes. For this month I needed to make muffins to serve with coffee for one of Frank's Concealed Pistol classes. I had some leftover zucchini that I had shredded and put in the freezer after using part of it for Zucchini Jam that I knew I wanted to incorporate. 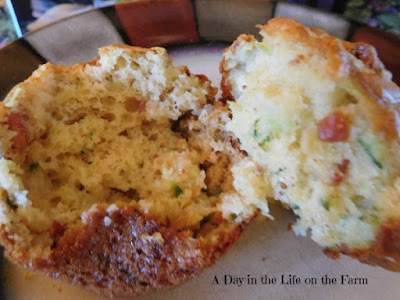 I also had some leftover bacon that I crumbled up and of course, every breakfast muffin must have cheese. I still had a brick of chipotle cheddar that I had received from Cabot Creamery when they sponsored Brunch Week at the beginning of the month. I thought the smoky goodness of this cheese would be perfect with the bacon and zucchini and I was right! There were only 4 students and a dozen muffins. Only two of the dozen remained after morning coffee. I would say they were a great success. Here are some more Memorial Day Muffins. Let's take a moment to remember those we have lost to protect our freedoms. What is this leftover bacon of which you speak? :) That has never happened in my house. That said, I'd fry up bacon just to make your muffins, Wendy! They look and sound wonderful! LOL it never used to happen at our house either but now my bacon still comes in one pound packages and there are only 2 of us eating it. I love it! Chipotle cheddar, bacon, zucchini, and chives! It's like a little casserole in a muffin! Yum. I wish I had a garden with an overflow of zucchini but these sound delish!! Thanks Paula and all you need to do is put in one plant and you will have more zucchini than you know what to do with. Mmmm... love all those components - these sound fantastic! Thanks Rebekah. Looks like you had a fun road trip. I've been in the South long enough that I read that as "Congealed Pistol Class" and was imagining some sort of Jell-o salad mold shaped like a pistol . . . Anyway, I used up a bunch of shredded squash I'd frozen last year just last week. I made fritters, though, but cooked them in bacon grease ;) . 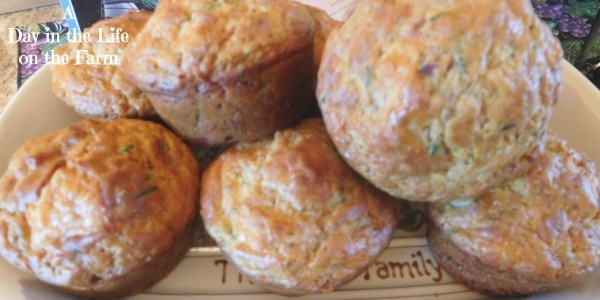 What a terrific idea for these muffins, and they look delicious. Too funny Kirsten, perhaps I should make that for the next lunch I serve at his class LOL. Serving Dessert for the Final Day of #Brunchweek.